We've got easyJet, easyBus, easyCar, easyGym, easyCoffee and easyHotels, so what's next from Stelios? 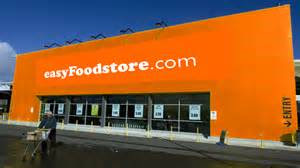 - easyFoodstore. The goods are unbranded and Stelios's sales pitch is 'no expensive brands, just food honestly priced'. Although floated as a concept in 2014, the first store has now opened in Park Royal, north west London, next to his easyBus depot. The tycoon is reported to have said that the idea was inspired after he saw the widespread use of food banks and that this is another way the Easy brand can serve the less well-off. 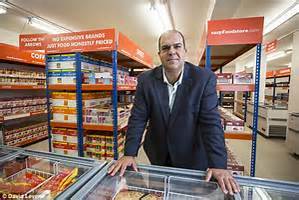 He believes that there is a gap in the market for cheap food, even below the prices charged of Aldi and Lidl, but Stelios's food stores are also likely to hit the 'big four' UK supermarkets too. But anything that is good for competition and that drives down prices is good for you and me! An easyFoodstore spokesperson is reported in the UK press today as saying that stores will be built in deprived parts of south-west London initially, with shoppers who will either be on benefits or in low-paid jobs. While most of Stelio's growing empire of Easy-branded companies have been a success, not all his ventures have taken off, with easyCinema and easyInternetcafe failing to make an impact. 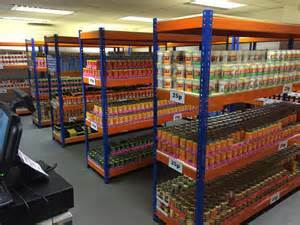 He is fond of gimmicks to promote his products and only time will tell if his recently launched easyCoffee, offering coffee for £1, and this new easyFoodstore with 25p produce, will succeed in a highly competitive food market. For those readers interested, I'm told that you can buy the following for 25p - chicken curry, noodle snack, chicken pizza, pasta sauce, chocolate-chip cookies, pitta bread, variety pack cereals, potatoes, orange juice, fairy cakes, Jaffa cakes, sardines in oil, strawberry jam, onion rings, American fries, pineapple chunks, baked beans, spaghetti, milk chocolate, tuna flakes, ravioli, variety crisps, mayonnaise, bombay mix and vegetable oil.